There are all sorts of music in the world. 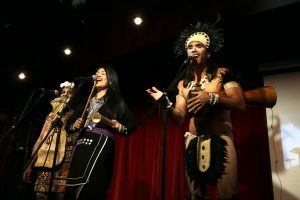 But have you ever listened to music from small islands in the Pacific and Indian Oceans? We have been getting to know “Small Island Big Song“, a group that shares music from small islands! 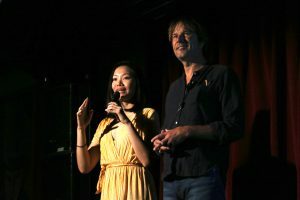 The creators Tim Cole and BaoBao Chen travel the Indian and Pacific Oceans to record with indigenous musicians and film them in their villages. 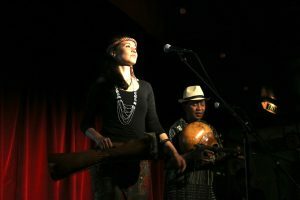 This time they travelled with five other musicians,Yoyo Tuki from Rapanui, Alena Ose Murang from Borneo, Sammy Andriamalalaharijaona from Madagascar, Charles Maimarosia from Solomon Islands, and Ado Kaliting Pacidal from Taiwan. 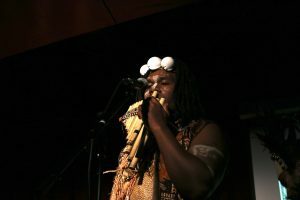 “There’s almost no one else who’s dedicated to learning and to playing the instruments, so someone’s got to do it.” The five musicians have been sharing their thoughts. 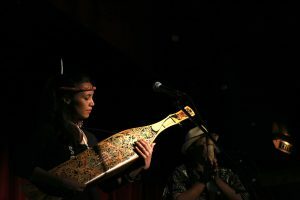 Because of changes in the modern world, a lot of traditional music is disappearing in their islands. These musicians are trying to preserve their music and share it with more people. 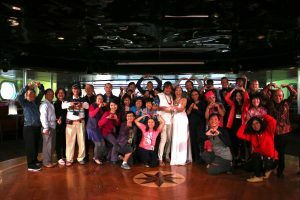 The two creators were also onboard for Peace Boat’s 94th voyage. They had a great experience and felt really thankful. This time they had a wedding party onboard and invited everyone to join! Inviting all the passengers to attend their wedding party. BaoBao is from Taiwan, so many Taiwanese participants joined the party! [98th Cruise Report]16-Tile Mahjong Competition!